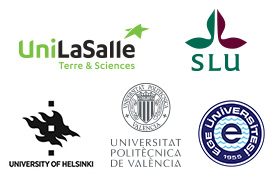 The Erasmus Mundus Joint Master Degree in Plant Breeding – emPLANT – welcomes applications from leading academics and professionals from all over the world to be part of the programme as invited scholars / guest lecturers. Objectives of stay of guest lecturers are varied: to teach and share knowledges with emPLANT students as well as take advantage of the stay to do some research and develop partnership with the host institution (working on joint articles, developing ongoing projects, strengthening the emPLANT network by identifying new ways of collaboration …). In order to see if you want to interact with our students on a topic taught in one the five universities of the consortium, please check the list of courses on the “Course Catalogue” section. You are also free to suggest a specific topic you want to share during your stay at the host institution. Guest lecturers are expected to teach courses or give seminars in their field of competence for at least 4 consecutive days in one host institution (travel time included). Top-level guest lecturers will be selected by the Executive Board based on excellence and on Consortium needs according to the specific topic of expertise. Applicants will be contacted for further information, if necessary. Selected scholars / guest lecturers receive information about logistical aspects at the host institution and about the scholarship they will receive. Please note that the emPLANT Executive Board may suggest modification of course contents should your proposal be accepted. Selected scholars / guest lecturers will be offered a scholarship to cover travel and accommodation costs and pay a remuneration. A “week” is defined as minimum 4 out of 7 consecutive calendar days. It is not possible to consider 8 consecutive days as 2 weeks. Guest lecturers have also access to the facilities of the host universities (library, sports facilities, laundry facilities, computer rooms, etc.). So if you are a plant breeding expert and want to share your knowledges with our emPLANT students, don’t hesitate to apply as you will bring added-value to the curriculum! To apply, please complete and send the application form and other requested documents to the e-mail address written in the document by May 15 for next academic year.